Katalox, taken back off the lead after breaking sharply under David Moran, stalked the pace on the inside and remained there while rallying from just off the pace to prevail by a head in Sunday’s $126,200 Bold Ruckus Stakes. 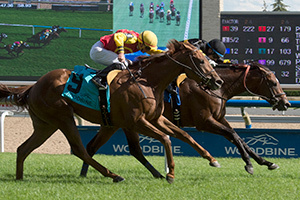 The Bold Ruckus, a six-furlong turf-race for Ontario-sired 3-year-olds, attracted a field of 11 and boiled down to a battle of longshots as the 12-1 Katalox edged 17-1 Dragon’s Cry in a thrilling finish. Katalox was winning his first stakes race for owners Racing Canada Inc. and Debmar Stables and was trying turf for the first time. Moran did take back when Katalox was challenged early by Lowi Vene as the quarter flashed by in :22.41 on firm going. Heading around the final turn, Hangtime and One Flashy Cat had joined the fray while Moran sat chilly and Lokinforpursemonee was launching a bid on the outside. The half went by in :45.34 and the top three were beginning to give way as Moran asked his mount for run. Katalox led by a half-length with a furlong to go and held sway over a stubborn Dragon’s Cry, who had rallied from midpack to challenge strongly but lost the battle to the wire. Dragon’s Cry ended one length to the good of a closing Sailing Home, the 2-1 favorite, who also rallied from midpack. Lokinforpursemonee loomed large in midstretch but could not maintain his momentum and weakened to finish fourth as the 5-2 second choice, beaten a length for the show as the 5-2 second choice. Hangtime wound up fifth and Signature Spring, the third choice at almost 3-1, never got into the hunt while ending sixth. Completing the order of finish were Courtly Manner, Where’s the Gold, Ben Lomond, One Flashy Cat, and Lowi Vene. Katalox, bred in Ontario by Sherry McLean, banked $75,000 while improving his record to 3-1-2 from seven starts. He returned $27.90, $13.20, and $7.60 and keyed some nice exotic payoffs. The 3-9 exactor with Dragon’s Cry ($13.80, $7.30) came back at $323.80. Sailing Home ($3.00) filled out a 3-9-5 trifecta of $783.95 and the 3-9-5-11 superfecta completed by Lokinforpursemonee came back at $783.95 for $1.